The MG4/MG8, built on Linux, are designed as SIP Open Standards platforms and support a variety of voice application environments and supplementary services to the Zultys IP phone system products, including auto dialing, caller ID, do not disturb and more. The MG4/MG8 are enterprise-class analog-to-SIP gateways that enhance IP phone system coverage of legacy analog phones, making it easy to integrate legacy phones into the Zultys Unified Communications solution. The MG4/MG8 are an ideal solution for businesses and organizations (such as retail, education and health care) that need to expand their analog trunks or extend the number of analog stations being served by their Zultys MX-SE or MX250 IP phone systems. 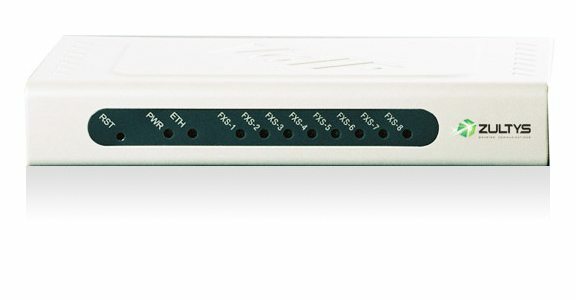 The MG4/MG8 multipurpose analog to SIP gateways are designed with the needs of the SMB and SME in mind. They convert the format of a phone call to allow it to pass between the SIP network and the public switched telephone network, and allow an organization to bring their analog phones fully into their Unified Communications environment to enable Presence, Status and other service features in the Zultys MXIE Unified Communications client that make it easier to contact others in the company. The MG4/MG8 offer rich features, high quality voice, and support major functions such as voice codec (G.711, G.729A) and echo cancellation. They also provides fax support over the analog FXO ports, and via the Zultys IP phone system.